Now available in the online Apple Store is the first accessory available for the USB 3.0 port on the Apple iPad Pro. The Lightning to SD Card Camera Reader will allow you to transfer photos and videos directly from your digital camera at USB 3 speeds, to the iPad Pro. On other Apple iPad models, and on the Apple iPhone, the Camera Reader will allow such data to transfer at USB 2 speeds. USB 3.0 can reach a signaling rate of 5Gbps, ten times faster than USB 2.0. Faster data transfers are welcomed by iPad Pro users, which means that you can expect many to shell out the $29 for the accessory. The Lightning to SD Card Camera Reader supports images using JPEG and RAW. It also works with SD and HD video formats. Once the microSD card from your camera is inserted into the card reader, the Photo app on your iPhone or iPad is opened automatically. Photos are divided up into Moments, Collections and Years. You can store all of your full resolution pictures and video in iCloud, and limit who gets to see these images or videos with iCloud Photo Sharing. Apple added the USB 3.0 port to its 12.9-inch slate somewhat uncharacteristically, considering that Cuprtino has favored the use of its proprietary connectors and ports. But for a project as important as the iPad Pro, Apple decided not to hold back anything pertaining to faster data transfers. Does yours work with the iPad Pro? What's a con for you, isn't for everyone else. Yes, it's a con for everyone. 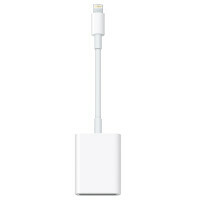 Instead of just buying a $2 adapter from amazon, you have to buy a proprietary one from apple. And with that they claw your eyes out, charging exponentially more money. Then, when one of my friend's iPhone battery dies, and they ask me for my charger, I can't help them because I have micro USB. iMessage is also more proprietary crap, that completely messes up texting (especially group chats) for people on Android and Windows Phone. And who does this benefit? No one but Apple. You can't use common sense with an idiot. They don't have the capacity for it. I mean look at the first post. He didn't even grasp the connection of costs of a cable that does the same thing and is cheaper. You never answered my question. Does yours work with the iPad Pro? Let me answer that for him : No it doesn't because it's Apple and they have to take extra money from you. Duh. Doesn't change the fact that it has a unnecessarily high profit margin. He is just showing how it doesn't justify the costs for a similar cable. And OTG cable is the same thing. Its just a MicroUSB to whatever is on the other end. Most of those cables for a very good ones is not more than $15. So why pay $30 for a cable that brings the same type of capability? Who cares if his works with the iPad pro or not. That fact it only works on one device, should make it cost even less...not more. $ 29 for a card reader? what a joke. Why so cheap? they should price it at $ 79. They can easily make more money out of the sheep. Cmon' apple! From what I gathered from the article, this isn't a true SD card reader since it's only good for photos. Another half-assed endeavor from Apple. That's the crapp|e strategy; sell you as many inferior hardware as you're dumb enough to buy. In this case, gotta buy a separate $1000 Mac to read the content a regular NTFS/Fat/exFat formatted SD card...they've been extremely spoiled by the ignorance of their iSheeps, they can't stop milking them. Just buy a surface with one inbuilt. What's the point of a tablet when you have to start sticking stupid attachments to it. That's not convenient at all. How is it a power user device, with no ability to increase storage without attachments. Doesn't solve much because the Surface only has a micro-SD slot, no 'pro' would be using micro SD cards when full size ones are faster, larger and cheaper. Only the Vaio Canvas fits the usage. Wait when did it get a USB 3.0 connector? I thought it was lightening connector? Lightning can run USB 3.0 and Thunderbolt 2 through the addition of a second set of pins on the cable. The iPad Pro is just the first for Apple's mobile devices to use 3.0. So basically you need an adapter to use an adapter of SD cards. Since there is no SD card slot, then yes, you need a cable. You don't need a special adapter to use USB 3.0, just a USB 3.0 Lightning cable. Given the size of the iPad Pro, why wouldn't they just put the card reader in the device? Now you have a cord hanging off your tablet when you want to transfer photos. I could understand if space was tight, but with the size of this thing there had to be room for a microSD card port.